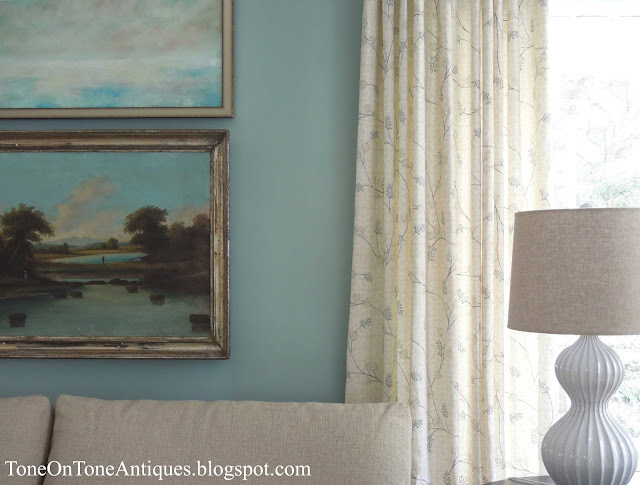 It's no surprise that I'm a fan of tone-on-tone color palettes! Whether inside or out, I find using shades of the same color soothing, sophisticated, subtle and harmonious. While there are interiors decorated in this style, it is more challenging to find tone-on-tone gardens - the exception being white gardens which have been popular since the Victorian period. By the way, I have made it a personal goal to visit as many white gardens as possible, so let me know your favorite(s)! 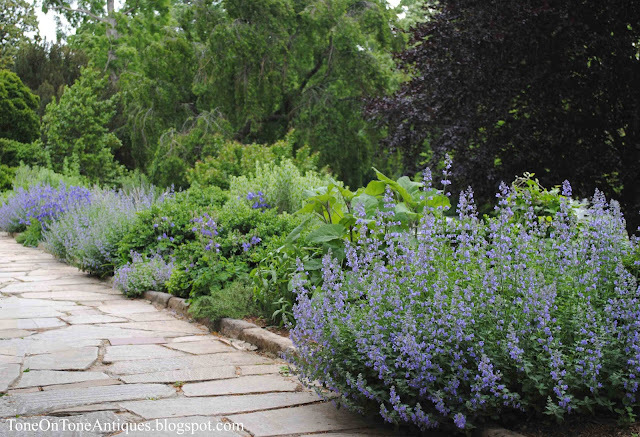 In planning and designing our blue garden, I frequented one of my favorite DC gardens for ideas and inspirations. 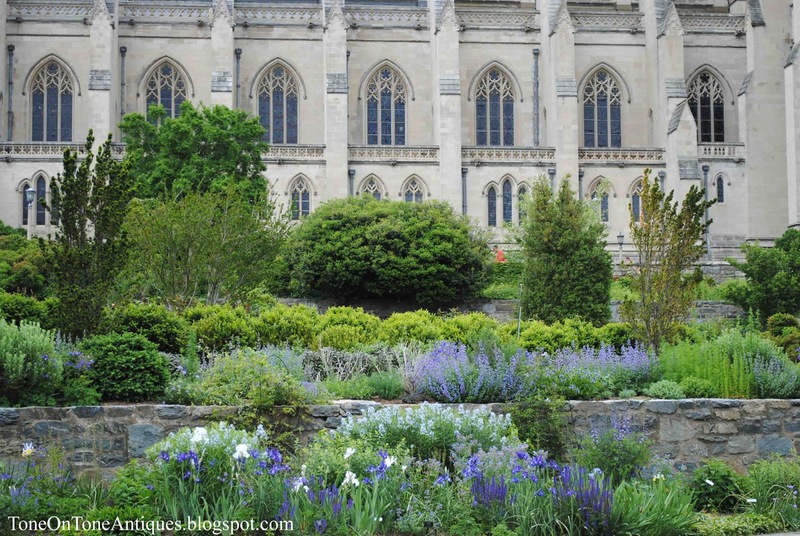 Located on the grounds of the Washington National Cathedral is the Bishop's Garden. Designed in the early 20th century by landscape architect Frederick Law Olmsted, Jr. and Florence Brown Bratenahl, wife of the second Dean of the Cathedral, this hillside garden is a gem worth exploring. 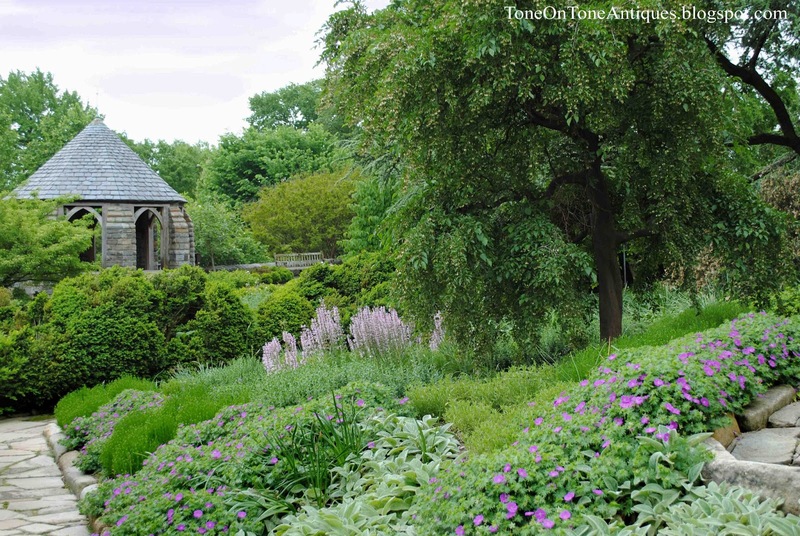 Inside the high stone wall are herb gardens, perennial borders and beds, a rose garden, a folly (the Shadow House), an expansive lawn, and medieval sculptures and architectural relics. These include a 9th century baptismal font supposedly from the Abbey of St. Julie in the Aisne, 12th century Norman stone arch, 15th century bas-relief plaques, etc. I recently met with a client at the Bishop's Garden to discuss designs for her blue garden. Enjoy these photos from mid May. 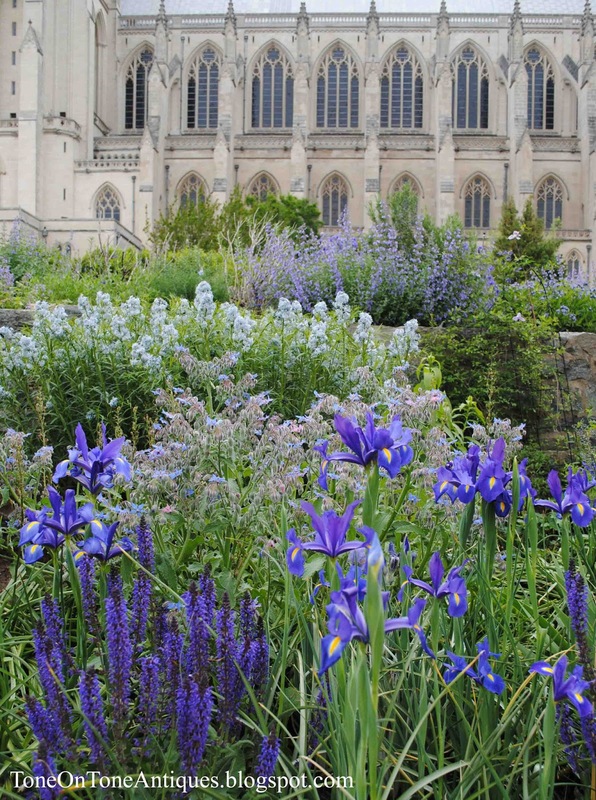 With the majestic cathedral as a backdrop and sounds of church bells ringing, the Bishop's Garden is truly spectacular. 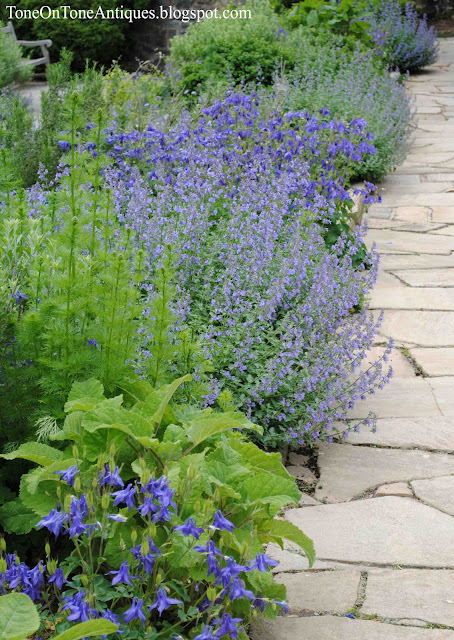 The lower perennial garden beds are known as the blue borders. 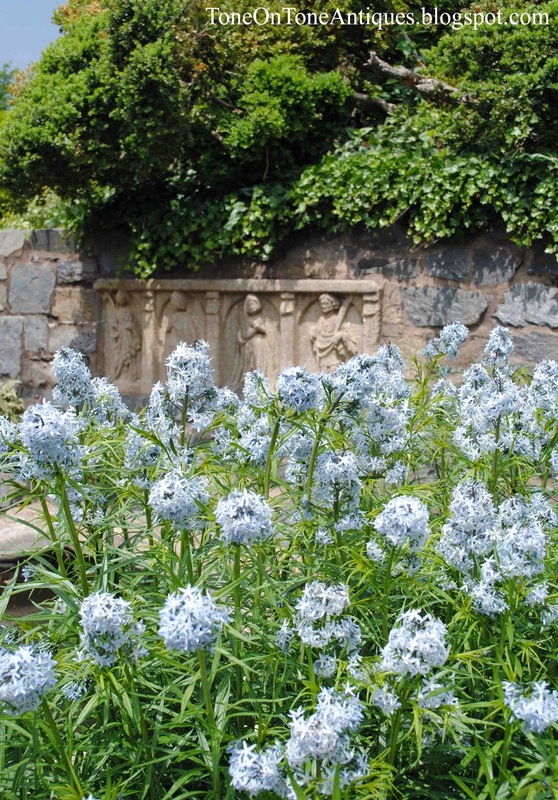 Next to the blue-gray stone walls, the predominately cool colored flowers create a layered tone-on-tone effect. 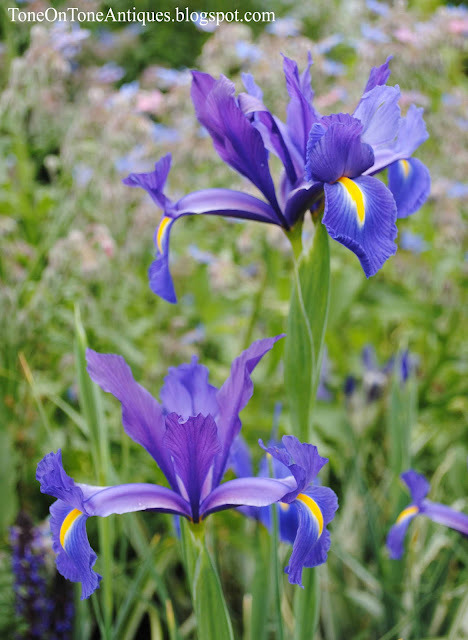 A stunning color field of blues, lavenders, purples and whites. Above are Baptisias. Below are Salvias (front left) and Siberian Irises (front right). A close up of Siberians - so pretty and delicate! Help! Can you help identify the above? My client and I both want this plant. 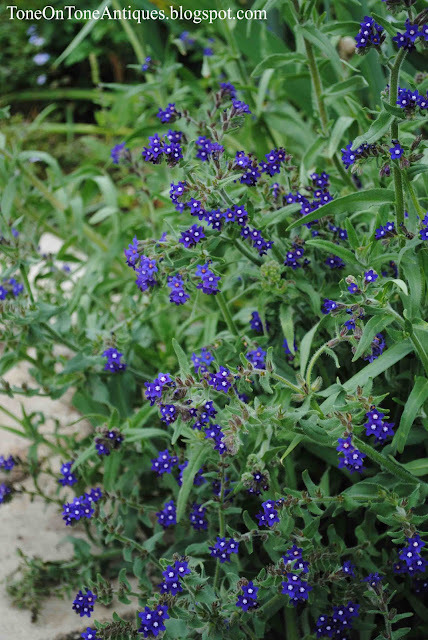 UPDATE: I just learned that is an Anchusa. Many thanks to Monica and Rosemary! Located on the south side of a hill, the blue borders get full sun and excellent drainage. 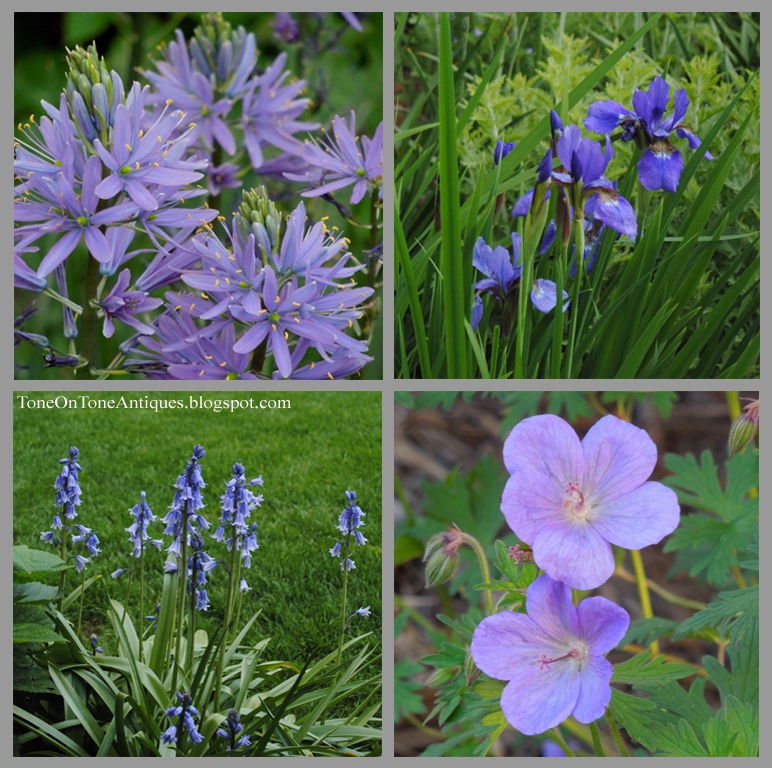 Once again, I took these photos in mid May. The borders are equally lovely at the height of summer when Agastaches, Buddleias, Lavenders and Russian Sages are in full bloom. 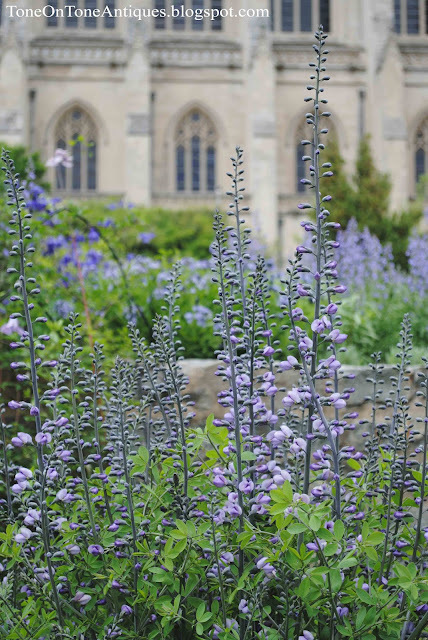 Here are the beautiful lavender-blue blooms of Nepetas. I love the royal blue color and feathery foliage of these Larkspurs, which are related to Delphiniums. 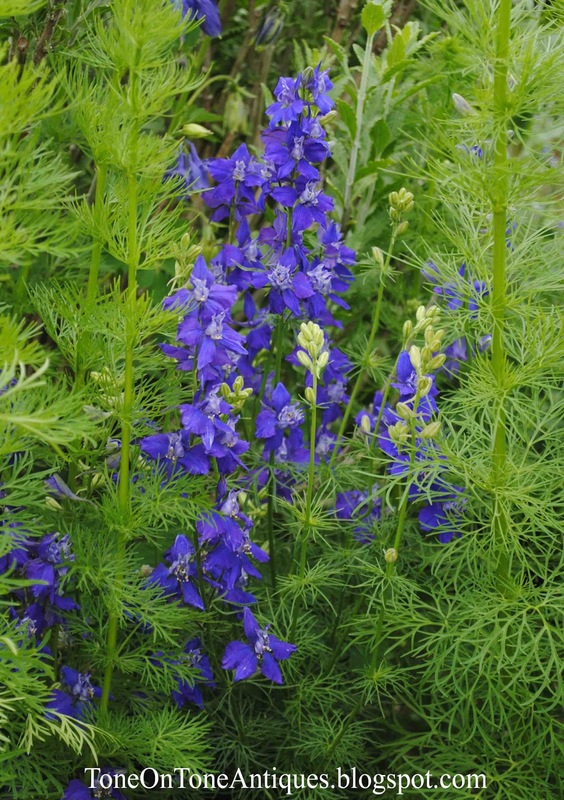 I cannot grow Delphiniums successfully with our very hot and muggy summers so perhaps I'll give Larkspurs a try. 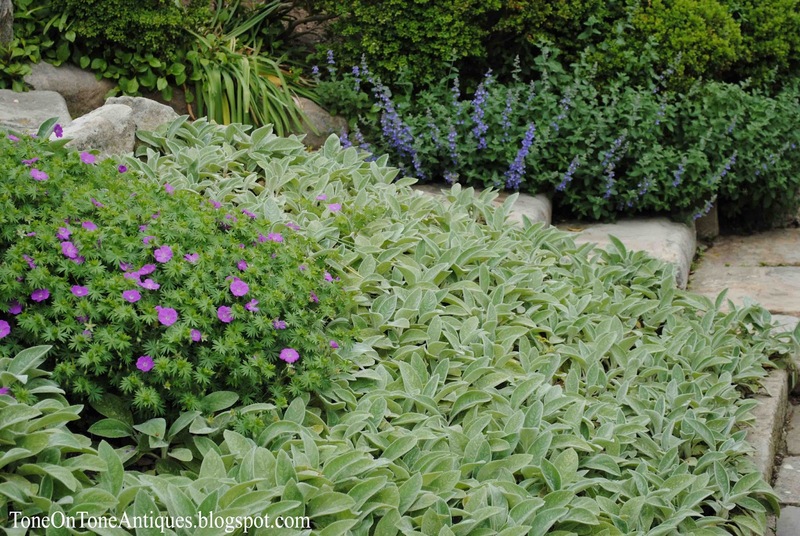 Thank you again to Rosemary for helping me identify these beauties! 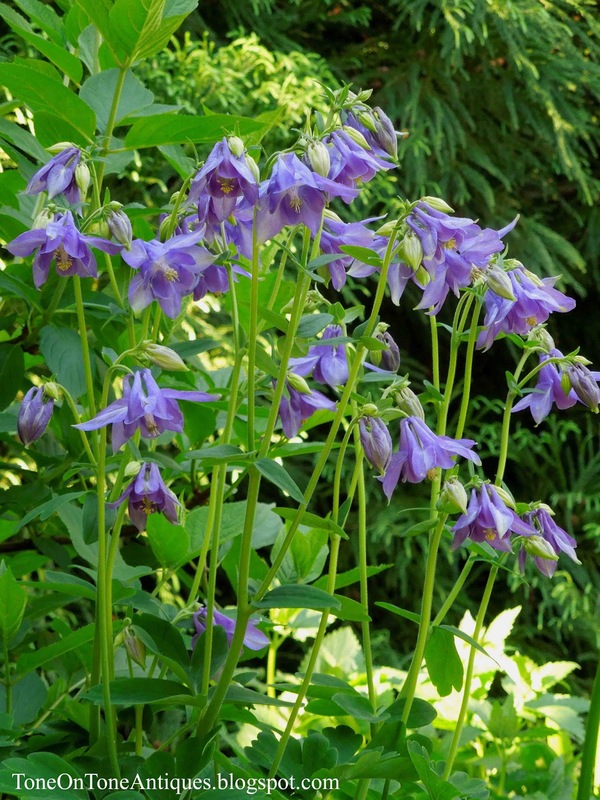 Aquilegias and Nepetas spilling over. Notice the repetition in color and plantings, both of which I practice in my designs. 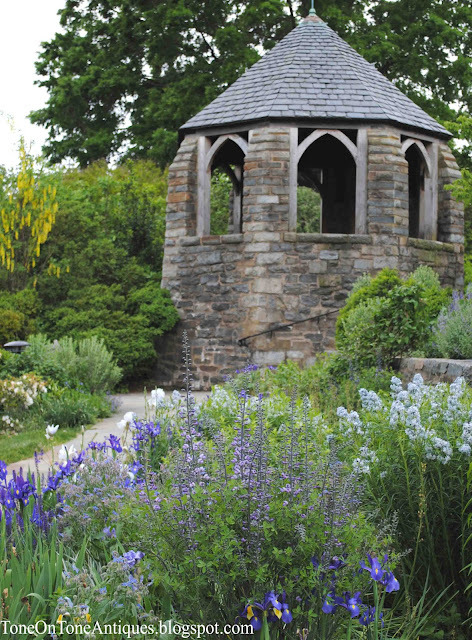 This charming folly is known as the Shadow House. Doesn't the setting remind you of the Cotswolds in England? 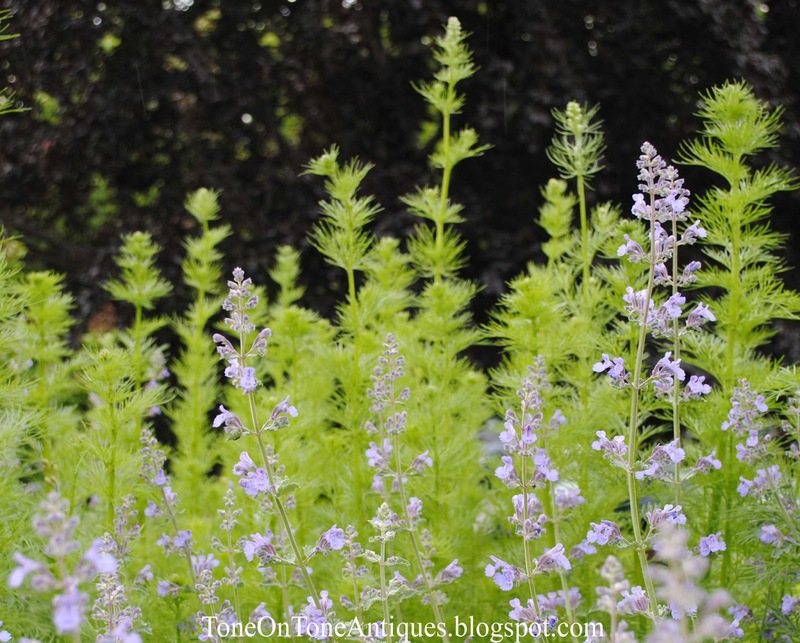 Just as important as flowers, foliage in a tone-on-tone garden should be carefully chosen. I find silvery and gray foliage, such as the Lamb's Ears above, complement a blue garden perfectly. 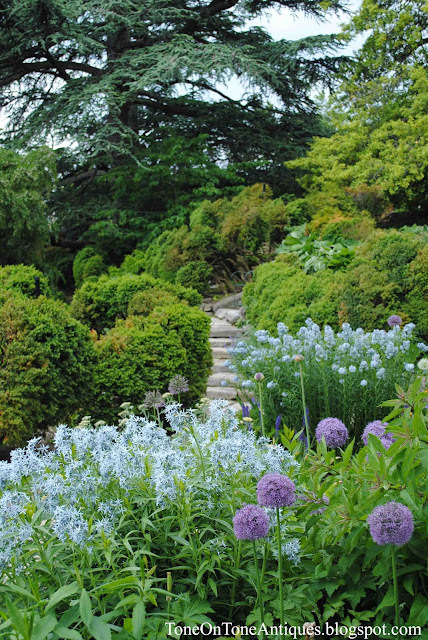 Icy blue flowers and wispy foliage make Amsonias must-haves in the blue garden. Behind is a 15th century carved stone bas-relief of St. Catherine and martyrs. Punctuating the borders in mid May were many purple Alliums. 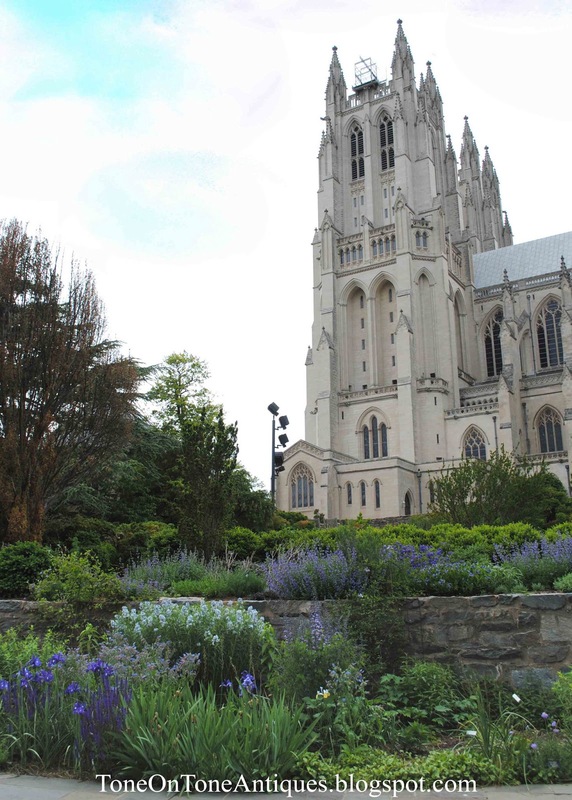 Not all the gardens at the National Cathedral are blue themed. In the Hortulus (little garden), the perennials and culinary and medicinal herbs are all inspired by plantings documented in a 9th century monastery. 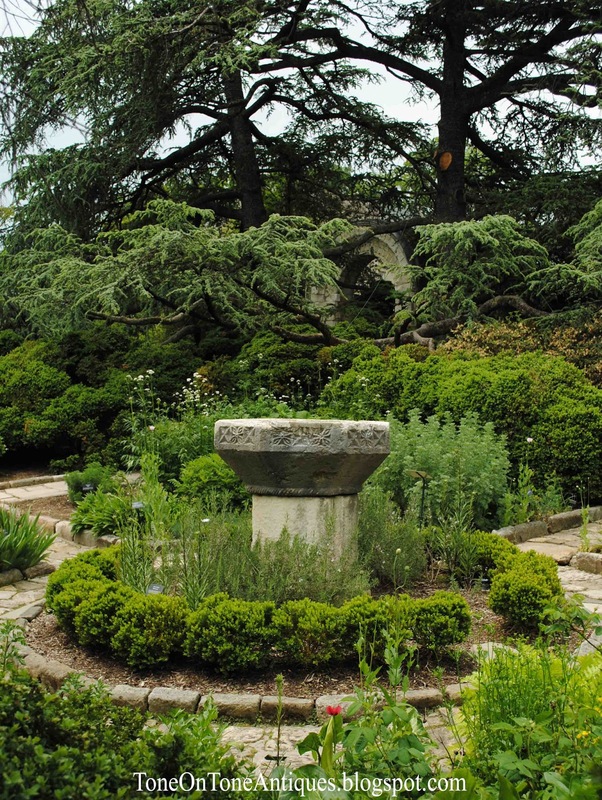 At the center is the French Carolingian baptismal font dating to Charlemagne's time. 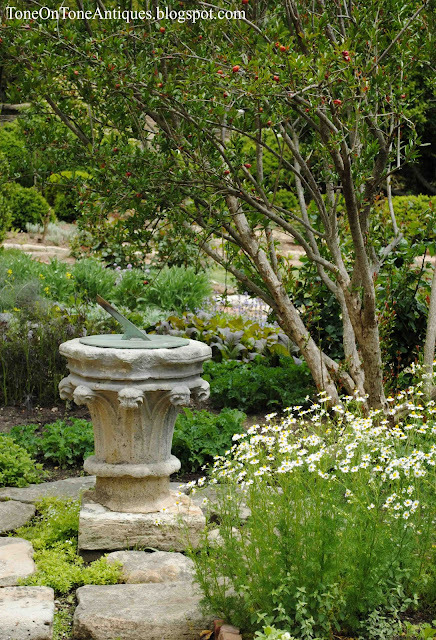 Nearby is this 18th century English bronze sundial sitting on a 13th century Gothic capital of carved limestone from a ruined monastery near Reims, France. I hope you have enjoyed this tour. To read more about the Bishop's Garden, visit here. And if you know of a blue or white garden, please share. Thanks! 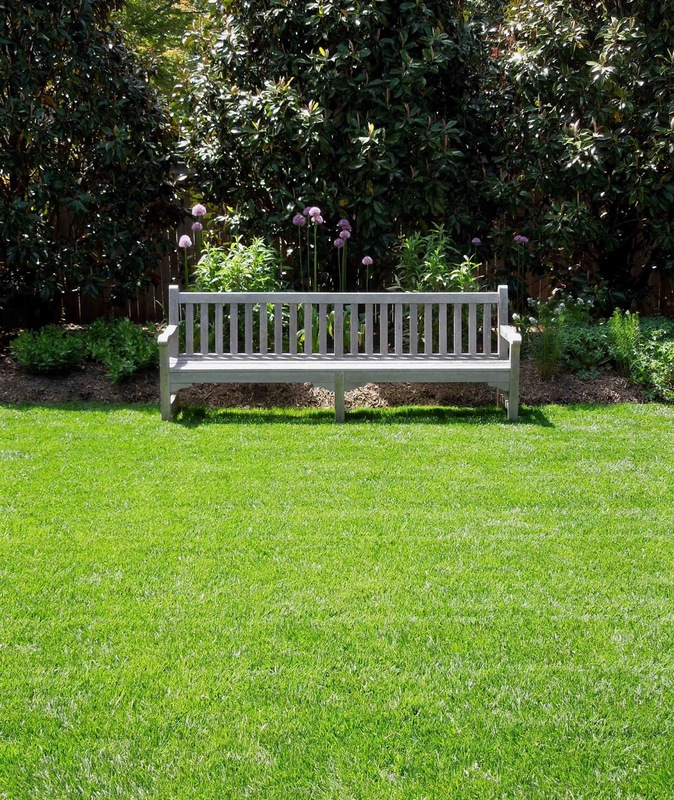 When my long time clients, Susie and her husband, shared news of leaving the DC area, I felt really bummed. 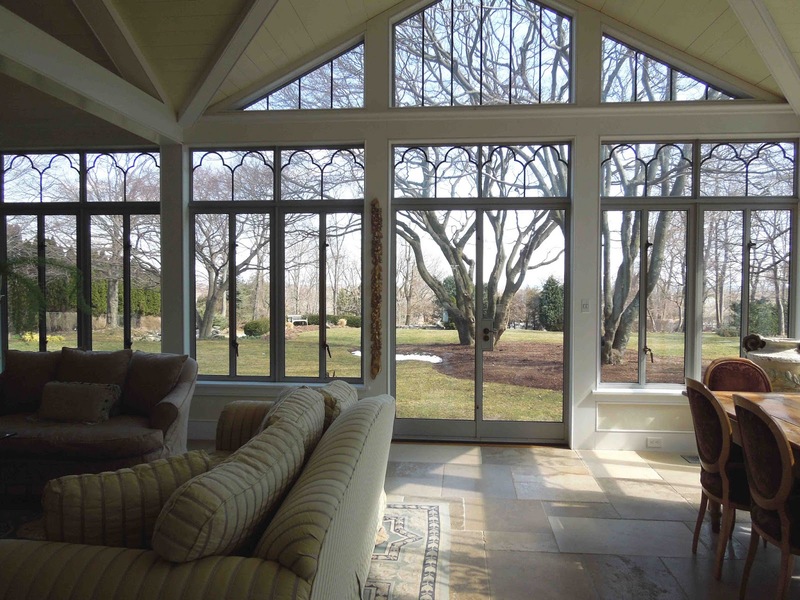 When I found out they were house hunting in Connecticut, I was relieved. Still a bit sad, though. 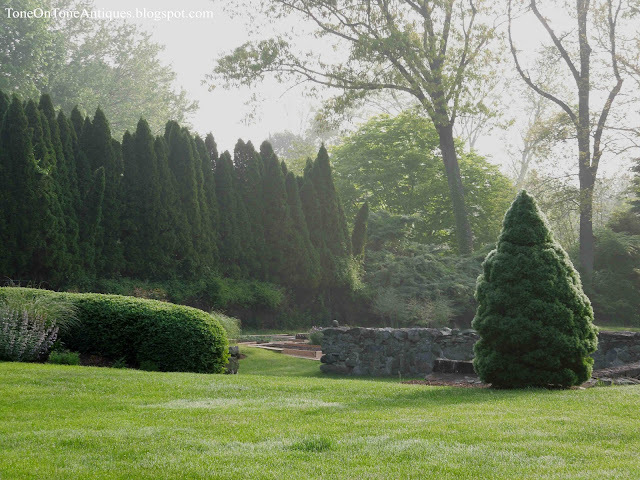 CT is about a 6 hour drive from DC, but at least it is on the East Coast. Plus, I visit CT quite frequently working with clients there. Then came even better news: Susie and her husband asked me to help with their new home - a historic 1864 farmhouse that had been renovated and expanded. 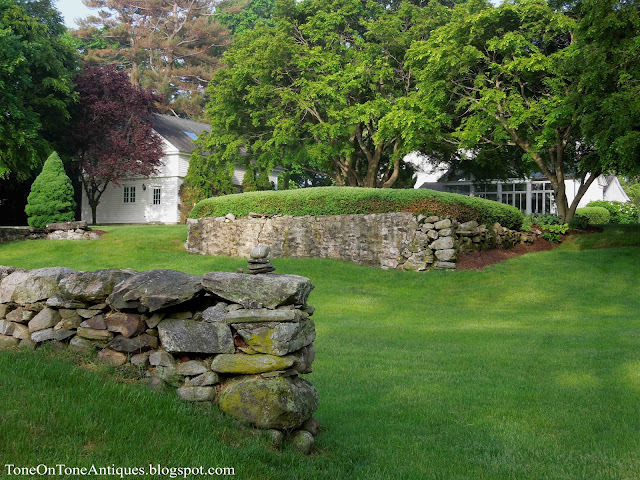 The farmhouse happens to be one of the original farmsteads in Fairfield, a county famous for its 'Southport Globe' onion fields. More on the onions later. Of course I thought I had 3-6 months to tackle this project. Nope! 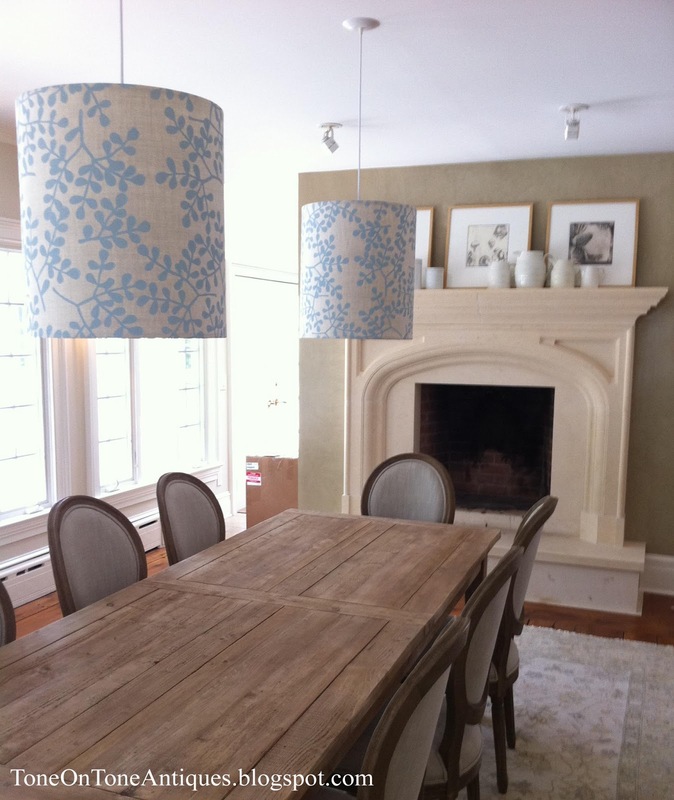 Because they had sold their DC area home and their kids would be on summer break soon, I had a little over a month and a half to start furnishing the house and line up contractors and workrooms: painter, wallpaper hanger, electrician, carpet installer, receiving warehouse, windows and upholstery workrooms. I couldn't have accomplished this project without all of Tom's help. Nor could I have done it without Susie's support and trust. It has been a total team effort, and I'm grateful to them both!! Tom and I just returned home from a big install. 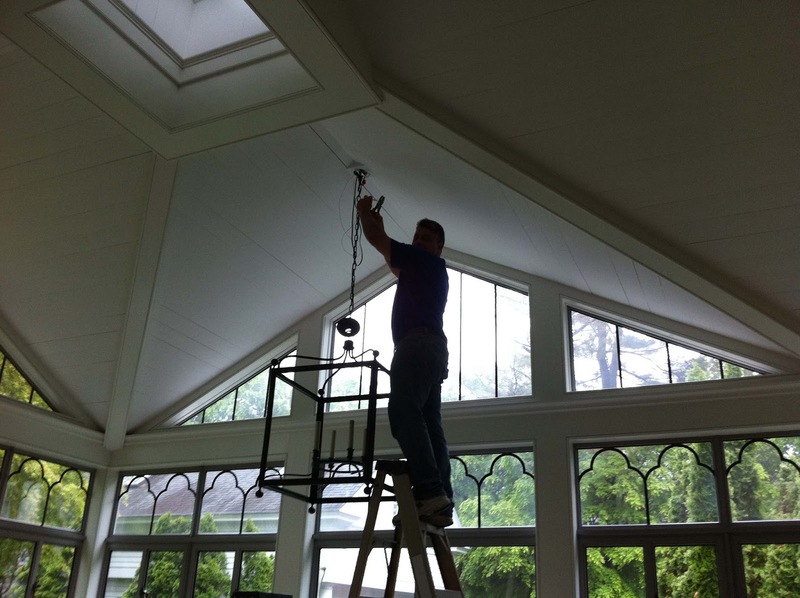 We will be finishing soon, and here is a preview starting with the conservatory. Built in 2002, the grand conservatory with its French limestone mantel and leaded windows from England is my favorite room. The clubchairs and ottoman are temporary. I placed those there for the family to enjoy while we wait for the arrival of the sofas, rugs, etc....all coming very soon! 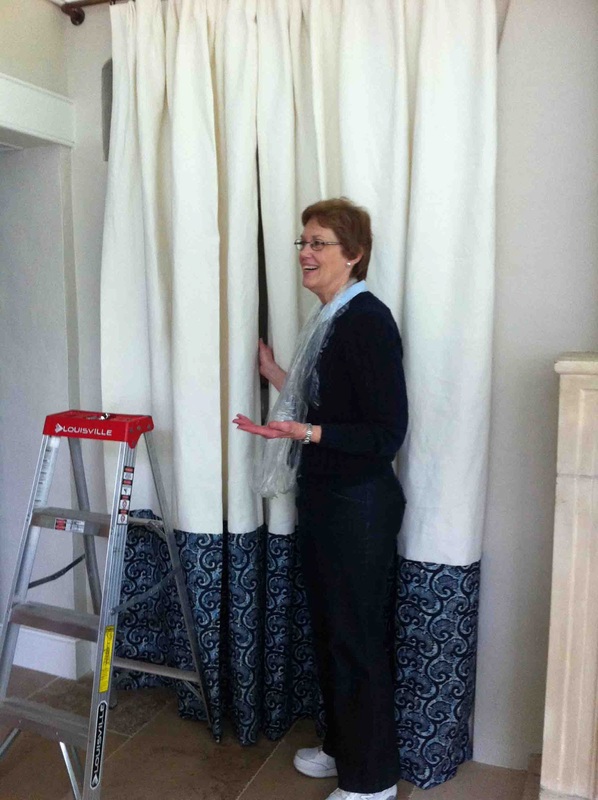 Cindy who made and installed all the curtains and shades did an amazing job. Thank you, Cindy! 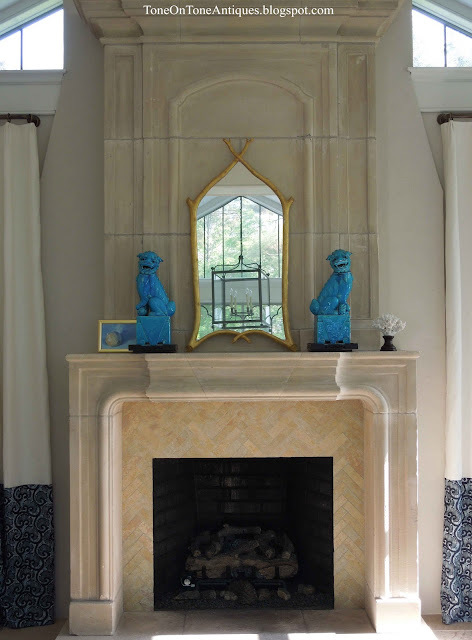 Why did I choose the color blocked panels flanking the fireplace? See below photo of the room as decorated by the previous owner. 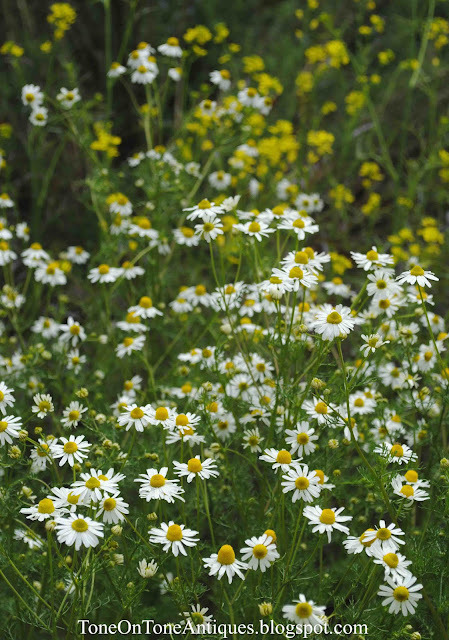 (I took the photo on my first visit.) While pleasant, the adobe-like niches did not appeal to us. 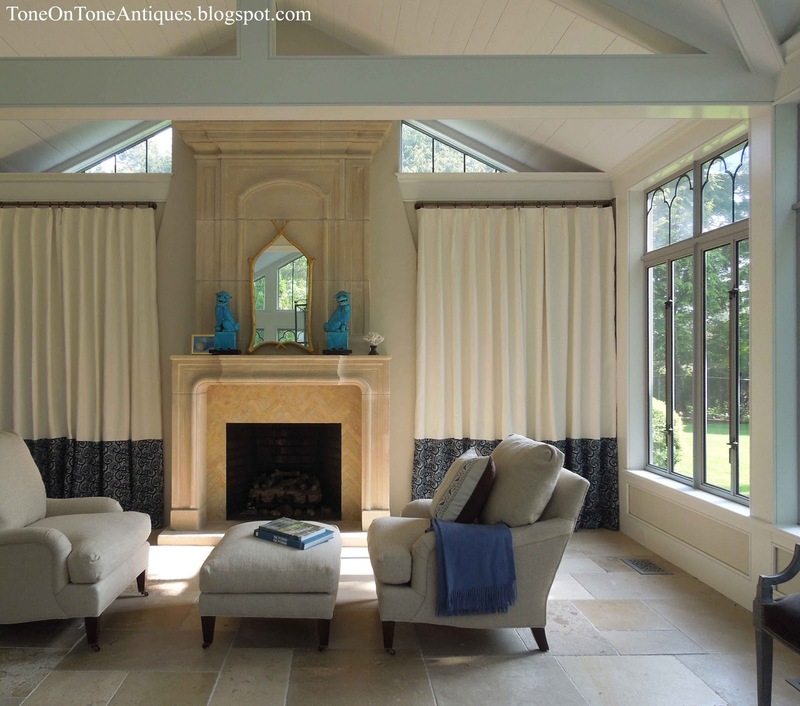 Instead of tearing out the niches (pricey and timely), I designed tall linen panels to conceal them and add softness to this room of exposed beams, glass and stone. I color blocked the bottom to break up the height. Below again is another photo I took during my first visit in early spring. And look at the view outside the conservatory now: gorrrrr-geous and green!!! As mentioned, this used to be a prominent onion farm. When the property was being cleared and landscaped, the vine covered stone walls were discovered to be the original fieldstone foundation of an onion barn. 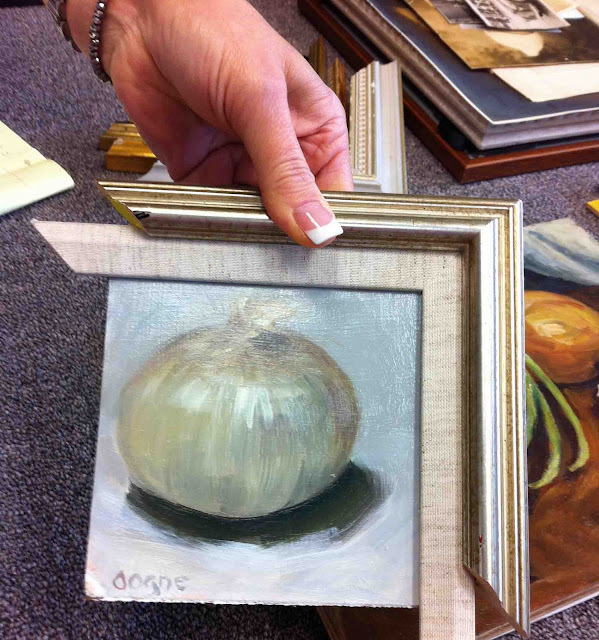 When Susie discovered her home's history of having been an onion farm, she decided to pay homage with a new collection of onion paintings found on Etsy. I took them all to my framer (her pretty hand, not mine) and selected various warm silver frames for the collection. 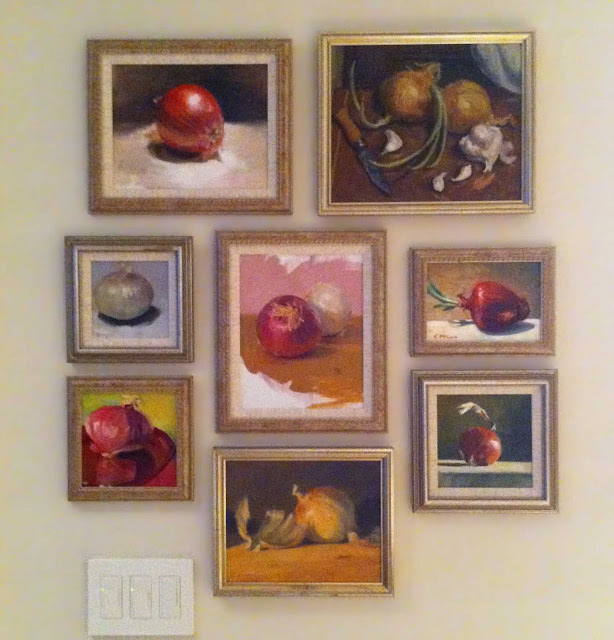 And here are some of the onions hung salon style in the kitchen. Sorry for the blurry photos....took these with my old iPhone. 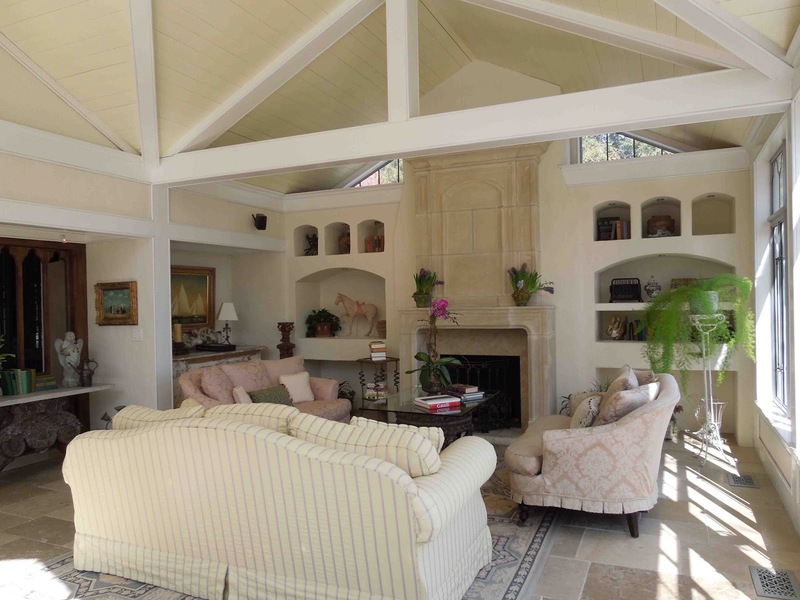 While the conservatory is sunny and warm, the original living room is cool and cozy. 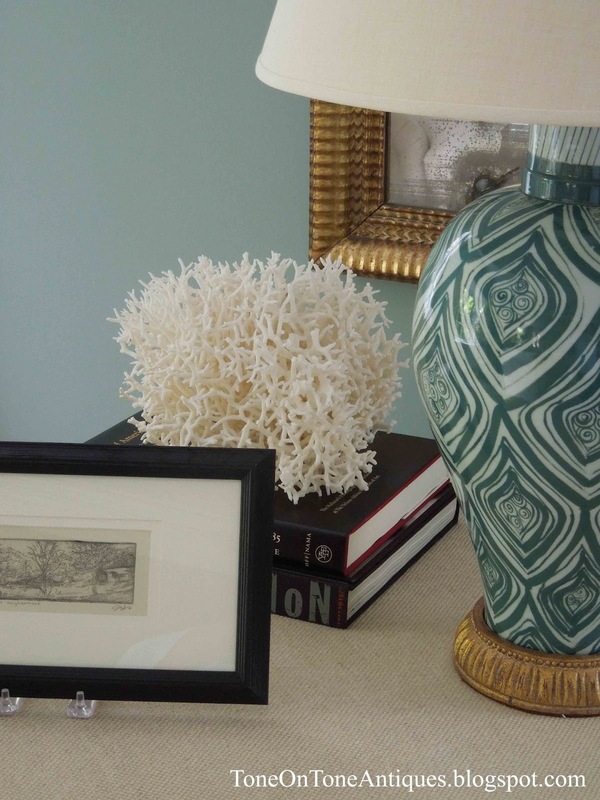 I chose pretty shades of blues, greens and aqua to complement the beaches in the area. 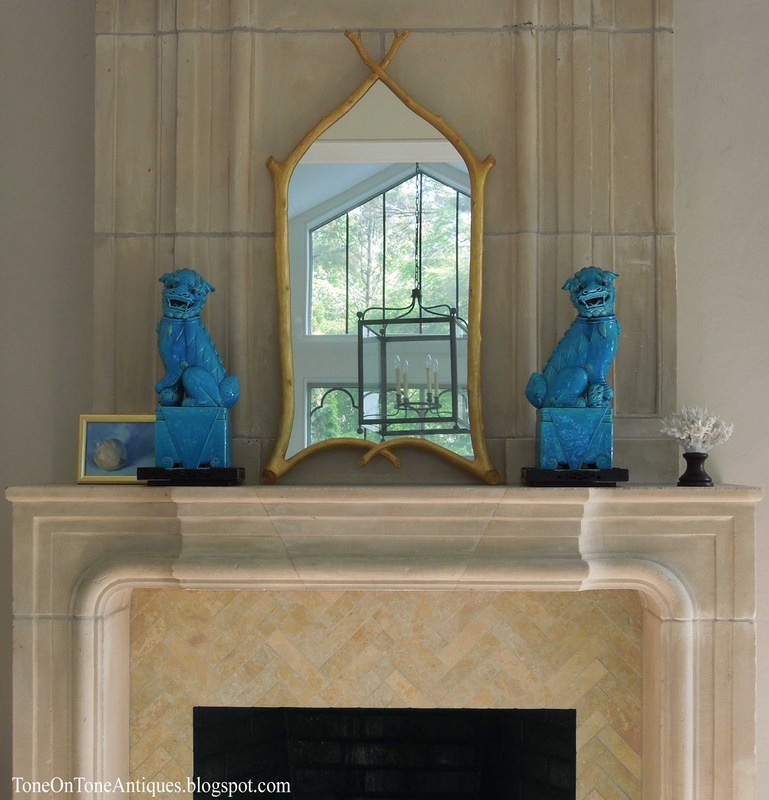 The coral piece and French giltwood mirror were two of the earliest pieces Susie found at my shop - almost 9 years ago! We have pillows and more accessories coming so stay tuned. 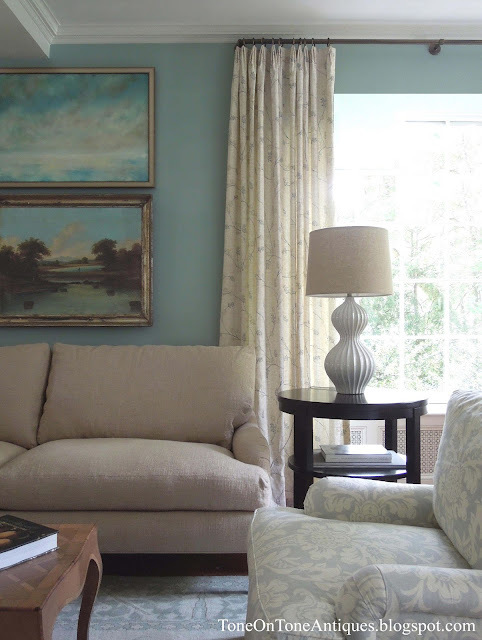 Many thanks to Susie and her family for allowing me to feature their beautiful home! Greetings! It has been way too long since my last post. I hope you all are well. Work has been incredibly busy, hence my absence. 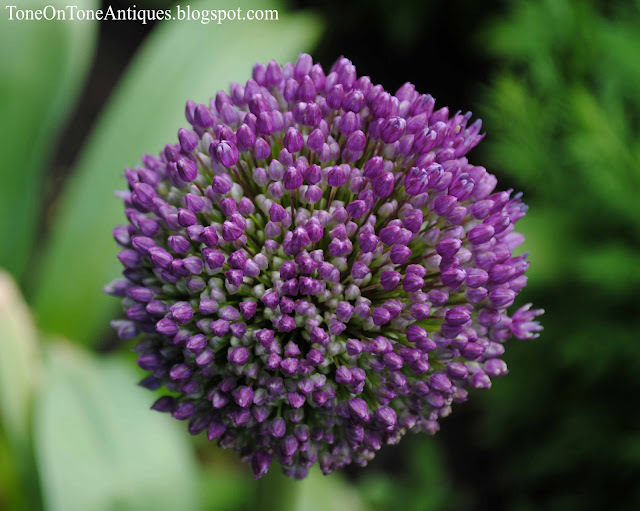 I look forward to resuming my weekly postings as I have many home and garden tours to share. Those of you following along on Instagram got a sneak peek of a photo shoot at our home. 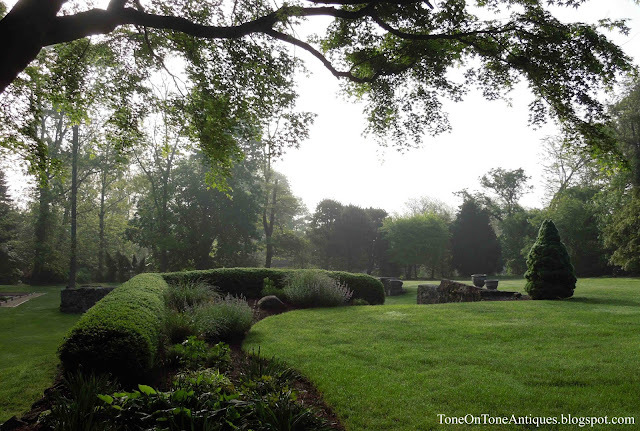 Southern Living Magazine is planning a couple stories and has been shooting here this week. We've been really lucky with weather - fingers crossed as we have one more day to go. 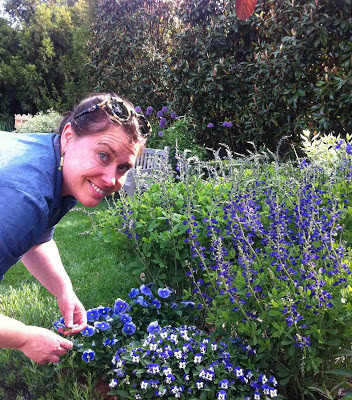 This week, I got a chance to meet two big names in the industry: Southern Living Garden Editor Rebecca Reed and Photographer Helen Norman. 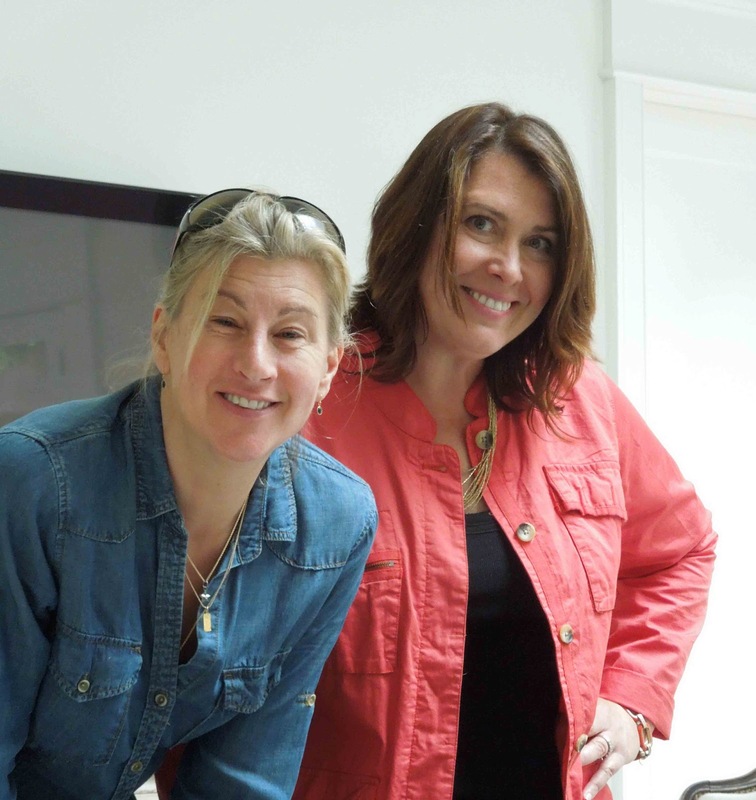 In addition to being super talented, these women are incredibly nice, warm and real pros. They made Tom and me feel completely at ease! While I can't share Helen's actual (OMG fabulous!) photos from the shoot, here are some I took. Hi, Helen (left)! Hi, Rebecca (right)!! Thank you BOTH for working tirelessly to make every shot special and beautiful. 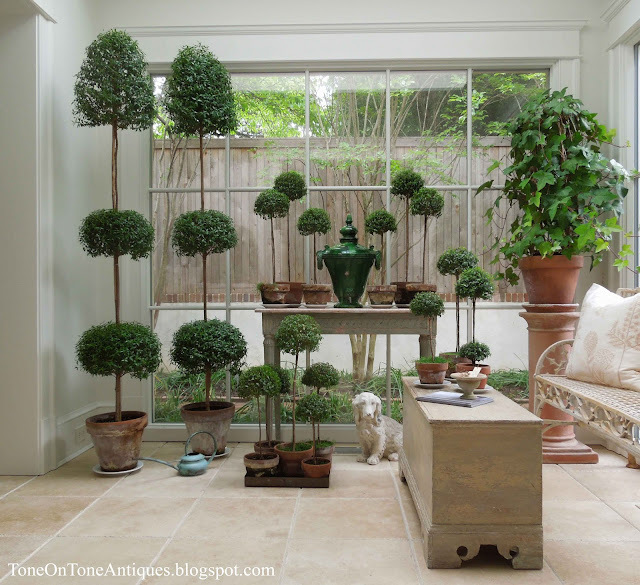 The first story Southern Living will feature is my topiary collection. Above is a pair of rosemary topiaries displayed in our living room. 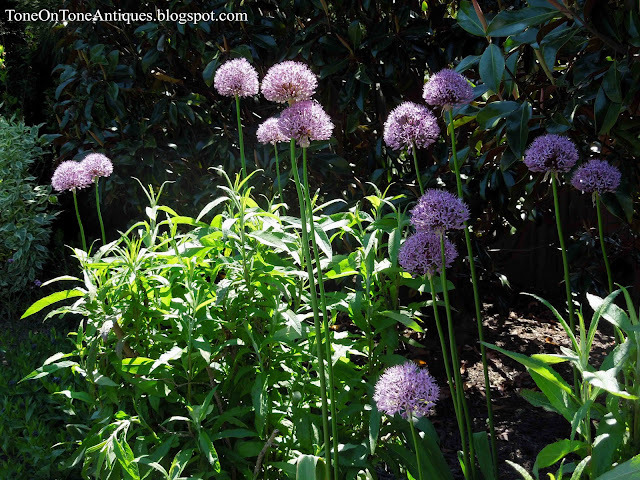 Below are a few of my 50+ myrtle plants in our small conservatory. 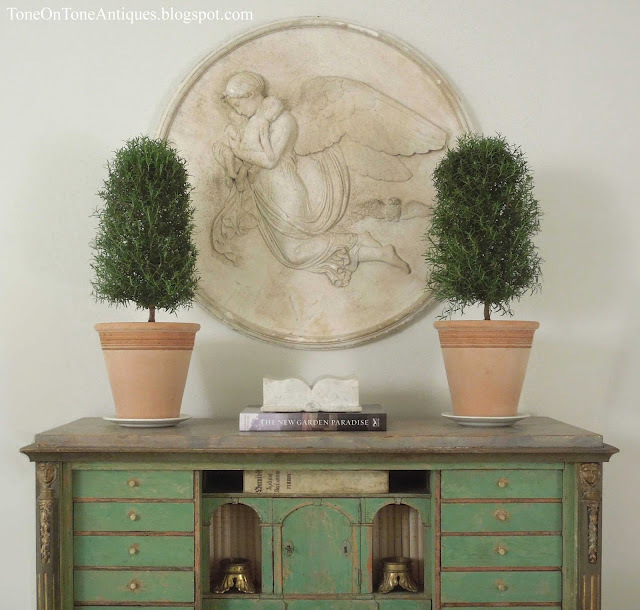 The painted console table is Swedish Gustavian while the blanket chest is American from the Brandywine Valley. Standing behind Rebecca is Helen's wonderful assistant and lighting whiz, Dan Stack. 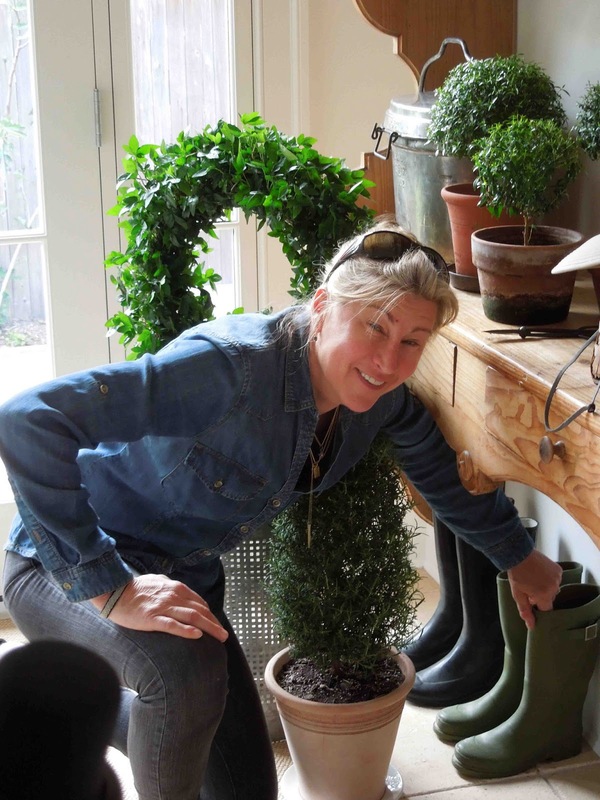 Below: Helen adding her magic touch to a vignette in our mudroom. 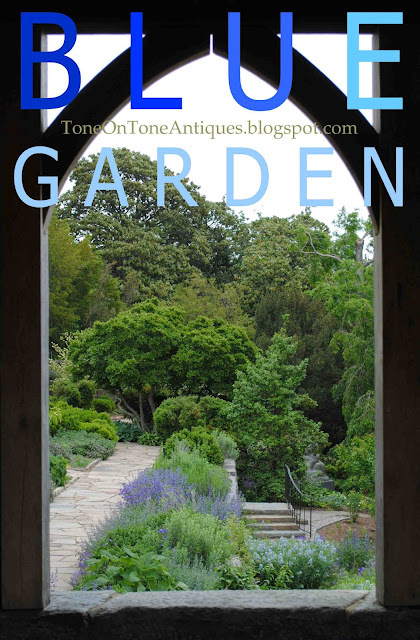 The second article will be about our gardens. 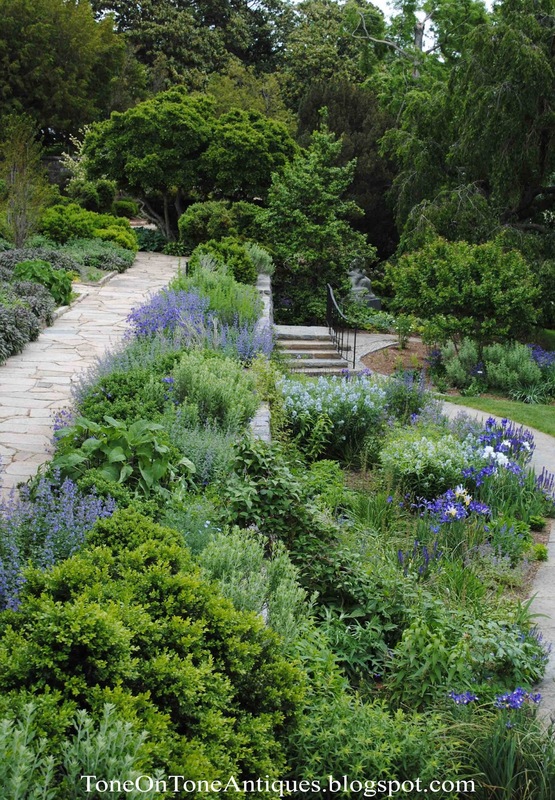 Here is a peek at our late spring blue garden which features primarily blue and lavender flowers. 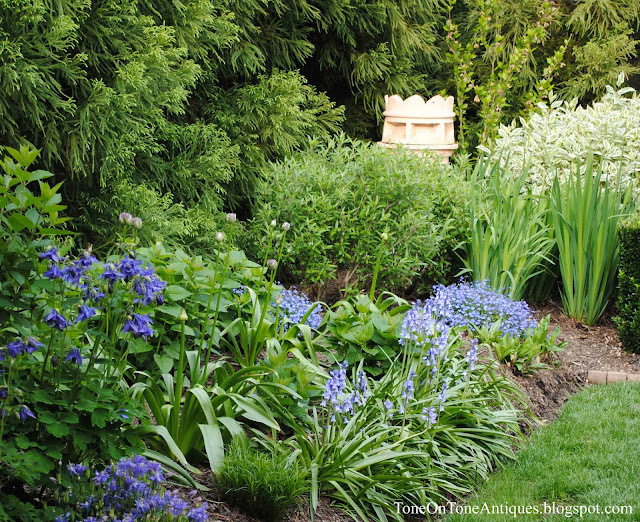 Below from left to right: Camassias, Siberian Irises, Johnsons Blue Geraniums, and Spanish Bluebells. 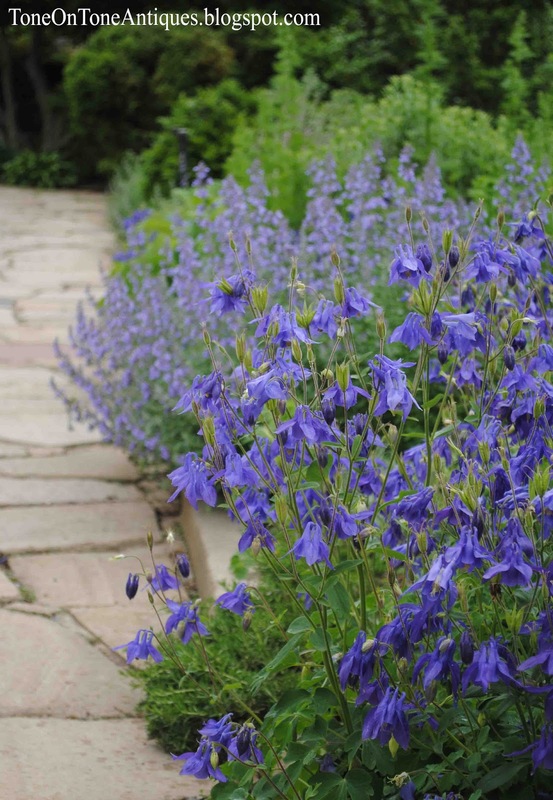 A closeup shot of lavender Columbines. 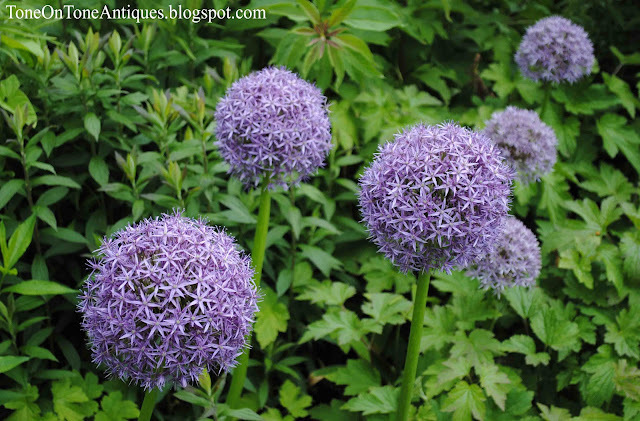 Purple Alliums behind a long teak bench. Rebecca is a styling genius, and here she is adjusting Pansies and Baptisias. 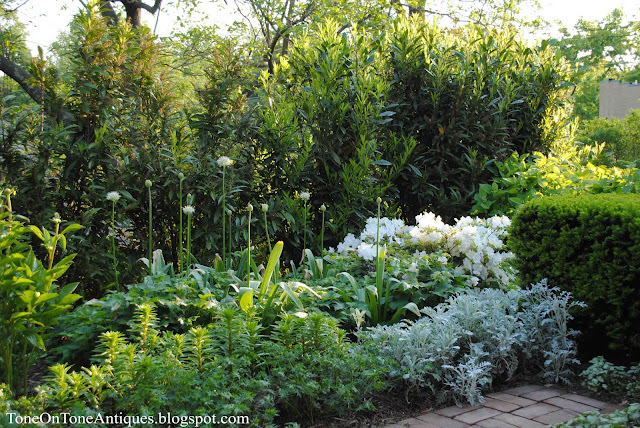 Moving to the north side of the house is our white border garden. 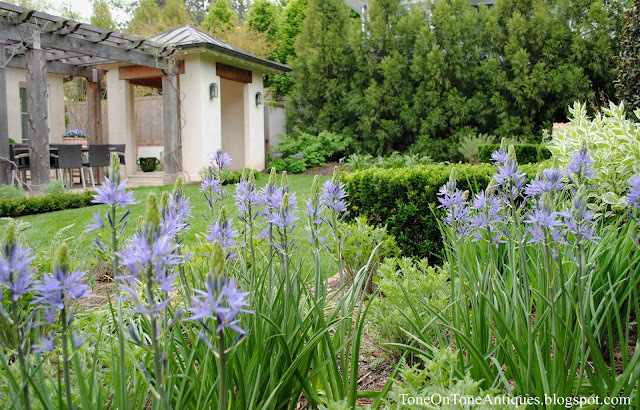 The white Alliums are just starting to pop while the white Azalea is at its peak. 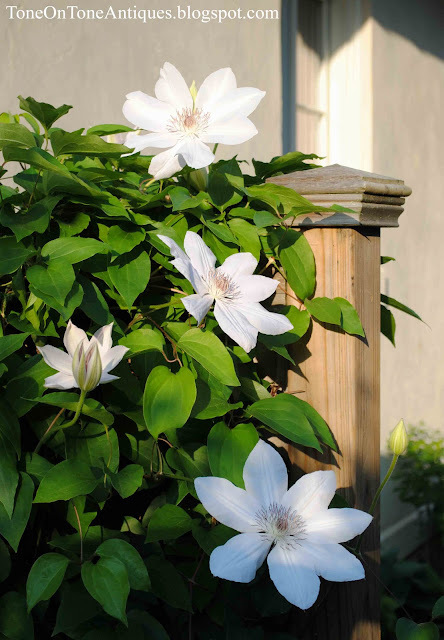 Above is Clematis Miss Bateman. 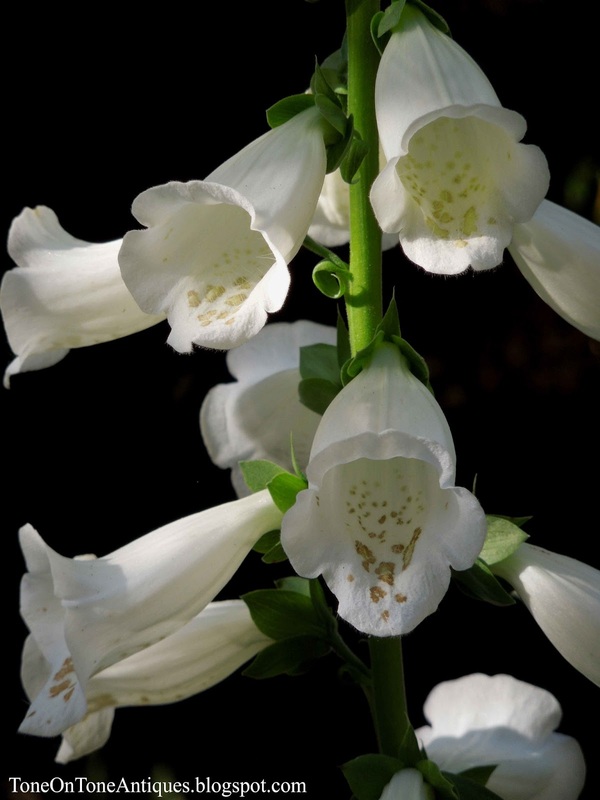 Below is Foxglove Camelot White. I will keep you posted on the publication dates. Many, many thanks to Southern Living! !